The 1st and 2nd September saw the 2nd JDX 470 Nationals 2018, with boats travelling from as far afield as New Zealand. 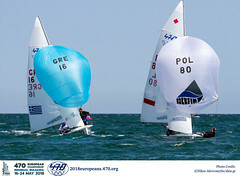 Weymouth and Portland National Sailing Academy saw the arrival of 14 Olympic Class 470s, with 7 being mixed pairings. 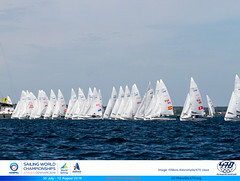 The first day saw champagne sailing with blue skies and 5-8 knots of breeze. The defending national champions Jonny McGovern and Christian Birrell came out of the blocks fast with two 1st’s and two 2nd’s, in the four races, to lead the event overnight. Tight racing meant there was little room for error with small mistakes proving costly whilst the friendly atmosphere only enhanced the racing. Post racing, JDX sponsored Beverages and snacks, which was very popular with all the sailors and volunteers. Following on from the tradition set last year, all the sailors and volunteers retired to the Stoggall residence for chilli, banter and more beverages. For some younger sailors the party continued in Weymouth whilst older sailors decided to retire to bed early with nice cups of Coco. 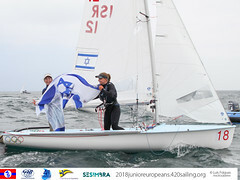 On day 2 the well-rested sailors faced similar conditions to the previous day with all the conditions keen to get on the water and racing. The maximum gusts of 10 knots meant ‘Oscar’ flag stayed firmly in his bag for the entire weekend, much to the relief of some of the older sailors in the fleet. Picking up where they left off on Saturday, our defending national champions took 2 bullets, a 2nd and discarded a 3rd in the four races of the day to become double JDX 470 National Champions. Jonny and Christian will be invited to represent the 470 class at the Endeavour 12-14th October in Burnham. The podium was made up by 2nd: Neil Marsden/Arron Chadwick and 3rd: Isabel Davies/Ryan Orr, Isabel was the first female helm overall. On behalf of the sailors, the 470 class would like to thank the volunteers for all their help because without them the event would not have happened. We would also like to thank Weymouth Portland National Sailing Academy for hosting us at their fantastic facilities for the weekend and JDX Consulting for sponsoring the event and for their continuing support of the 470 Class; #JDXCanDo. Overall the event was a huge success and it is time to plan next year’s JDX 470 nationals.